The arbiters of fashion looked to the heavens above for inspiration at this year’s Met Gala and the jewels worn by the glitterati on the red carpet were up to the divine challenge. Heavenly Bodies was the theme of this year’s fundraiser for the Metropolitan Museum of Art’s Costume Institute held Monday and those lucky enough to stroll the majestic steps of the museum to the private dinner inside were wearing their Sunday best with elaborate Catholic-themed outfits by Versace, Chanel, Christian Louboutin, Saint Laurent and others. Pairing jewels for the costumes must have been a challenge. The usual barrage of diamonds and colorful gems took a back seat for black gems and lacquer. Vintage jewels made appearances but fewer than I would have expected considering the theme. Yes, crosses were a popular motif, along with elaborate filigree and openworked designs. Yellow gold and white metals were both appropriate with the theme and used often. No one took to the theme of the event quite like Cartier, which opened up its vault to share its historic Cartier Collection jewels, occasionally paired with some of its contemporary pieces. Rihanna—co-chair of the event along with Amal Clooney and Donatella Versace—wore the Cartier Collection pendant as a necklace. The jewel began its life as a lone crucifix in 1934 made of gold, silver, diamonds, sapphires, round faceted rubies, button pearls, opal and round faceted topazes; and then was paired with the “Dove of the Holy Spirit” in 1949, made of gold, diamonds, a 17.20-carat star sapphire, sapphires, rubies, emerald, pearl, moonstones and opal. To further adorn her Papal-inspired outfit, she wore diamond rings by Gilan and Narcisa Pheres, and gold hoop earrings and a pearl ring from Konstantino Jewelry. Several others also chose to wear old and new jewels from Cartier. Actress Lily Collins wore a Cartier Collection necklace, circa 2007, made of 18k white gold and diamonds; Cartier Collection earrings, Paris, 1929, made of silver, 18k white gold, onyx; and Cartier Paris Nouvelle Vague ring made of 18k rose gold, black lacquer, diamonds. Actress Priyanka Chopra chose several Cartier yellow and rose gold jewels to go with her Ralph Lauren crimson velvet gown, and gold and gem beaded hood, including a Cartier Collection pendant, 2000, 18k yellow gold, rubies, sapphires, emerald; a Cartier Collection ring, 1995, 18k yellow gold, rubies, emeralds, sapphires, diamonds; two Cartier Collection rings, 1992, 18k yellow gold, rubies; Cartier Collection ring, Paris, 1945, 18k yellow gold, emerald, rubies; a Cartier Collection ring, 18k yellow gold, blacklacquer, citrine,diamonds; a Cartier Collection ring, 2006, 18k yellow gold, blacklacquer, peridot, diamonds; Cartier JusteunClou ring, 18k rose gold, diamonds; and a Amulette de Cartier ring, 18k rose gold, onyx, diamond. Actress Michelle Williams wore a Cartier High Jewelry bracelet in 18k white gold, black lacquer, diamonds totaling 29.88-carats; and a Cartier Paris Nouvelle Vague ring in 18k white gold. Actress Naomi Watts wore a Cartier Collection bracelet, 1939, with platinum, 18k white gold and diamonds; Cartier High Jewelry earrings, platinum, yellow diamonds, onyx and diamonds; and a Coup d’Éclat de Cartier ring, 18k yellow gold and diamonds. Director Sofia Coppola wore Cartier Collection earrings, platinum and diamonds; and a Cartier Collection bracelet, New York, 1936, platinum, 18k white gold, blacklacquer and diamonds. The big bold look of Bulgari’s heritage and contemporary jewels with their elaborate yellow and rose gold designs was a big hit on the religious-themed red carpet. Bulgari brand ambassador, Lily Aldridge, wore a number of Bulgari pieces, including a platinum, emerald and diamond High Jewelry necklace; a white gold, emerald and diamond Giardini High Jewelry necklace; a platinum, emerald, diamond and pearl High Jewelry necklace; an emerald and diamond Heritage ring, 1992; and a white gold and diamond High Jewelry ring. Model Winnie Harlow was decked out in Bulgari jewels that included a High Jewelry white gold and diamond bracelet; a High Jewelry white gold and diamond ring; two Bulgari platinum and Diamond rings; a Bvlgari High Jewelry ring with tanzanite and diamonds; a Divas’ Dream bracelet in white gold and diamonds; two platinum and diamond Bulgari Griffe rings; and a Bulgari high Jewelry necklace in white gold with diamonds. Model Joan Smalls wore a yellow gold necklace and bracelet from Bulgari’s Parentesi Heritage collection. Model Jasmine Sanders wore Bulgari Parentesi High Jewelry bracelet and necklace in rose gold and pavé diamonds. British model Jourdan Dunn wore Bulgari white gold and diamond earrings and rings from Bulgari’s Serpenti Collection; and a white gold and diamond Diva’s Dream High Jewelry ring. Chopard will make its big red carpet entrance at later today with the opening of Cannes Film Festival, but the Swiss luxury brand made its mark at the Met Gala with a number of its jewels. Livia Firth, founder and creative director of Eco Age who has been working with Chopard’s sustainable business development program, strolled the red carpet with her husband, Colin Firth, wearing earrings from the High Jewelry Collection, featuring 21.21 carats of tsavorites and 11.96 carats of colored diamonds set in 18k yellow gold and titanium; a necklace (worn as bracelet) from the High Jewelry Collection, featuring 68 pearls, 417.30-carats of chrysoprase beads set in 18k white gold; and a selection of rings from the L’Heure Du Diamant Collection, each featuring 2.01-carats of diamonds set in 18k white gold. Recording artist, actress and model Cassie, wore Chopard stud earrings featuring two 6-carat emerald-cut diamonds set in platinum from the High Jewelry Collection, and a selection of rings featuring diamonds set in 18k rose gold and 18k white gold from the Ice Cube Collection. Kylie Jenner wore Chopard earrings featuring two 5-carat cushion-cut diamonds set in platinum from the High Jewelry Collection. Model Imaan Hammam wore Chopard earrings featuring 13.93-carats of pear-shaped diamonds and 1.22-carats of diamonds set in 18k white gold from the Precious Chopard Collection, a ring featuring a 2.51-carat oval modified brilliant-cut diamond set in 18k white gold from the High Jewelry Collection, and a ring featuring 1.50 carats of diamonds set in 18k white gold from the L’Heure Du Diamant Collection. Romanian model Andreea Diaconu wore Chopard black diamond earrings from the Imperiale Collection; and a selection of Chopard rings including: a ring featuring 2.65-carats of diamonds set in 18k rose gold from the La Strada Collection; two rings featuring a 0.70-carat heart-shaped diamond set in 18k rose gold from the High Jewelry Collection; a ring featuring 1.14 carats of diamonds, with rubellite and rubies set in 18k rose gold from the Temptations Collection; a ring featuring 1.87-carats of round-shaped pastel pink sapphires set in 18k rose gold from the L’Heure Du Diamant Collection; a ring featuring 3.80-carats of pastel pink sapphires and .42-carats of diamonds set in 18k rose gold from the Ice Cube Collection; and a ring featuring 0.60 carats of pink sapphires set in 18k rose gold from the High Jewelry Collection. The big, bold and elaborate jewels from Jacob & Co made several appearances on the red carpet. Among the notables was Zoe Kravitz who wore drop earrings featuring approximately 100 carats of pear shape morganite and 10 carats of diamonds (approximately 460 stones). Zoe also wore Jacob & Co.’s 7-carat vivid pink emerald cut diamond ring set with pink and white diamonds. Model Cindy Crawford wore Jacob & Co. rubelite 45-carat drop earrings as well as a ruby and diamond ring with an 11- carat cushion cut ruby center and round cut diamonds. Model Taylor Hill wore Jacob & Co. diamond drop earrings comprised of 15 carats of diamonds set in platinum, a diamond cross with 13 carats diamonds set in white gold, a custom chain set with 20 carats of round diamonds, and a Dome ring with 15.74 carats of pavé white diamonds (928 Stones). Madonna—who is famous for her religious-themed, fashion clothes—attended the Met Gala wearing Narcisa Pheres onyx and diamond earrings, sword diamond ring and mesh hand cuffs. Poppy Delevingne was adorned in David Webb jewels, including David Webb Fusion Earrings with rectangular-cut peridot, brilliant-cut diamonds and polished 18k gold and platinum; the square-cut Peridot Ring with brilliant-cut diamonds, 18k gold and platinum; and the Heraldic Brooch with rectangular-cut kunzite and peridot, oval and circular-cut rubellite, brilliant-cut diamonds, white enamel, 18k gold and platinum. 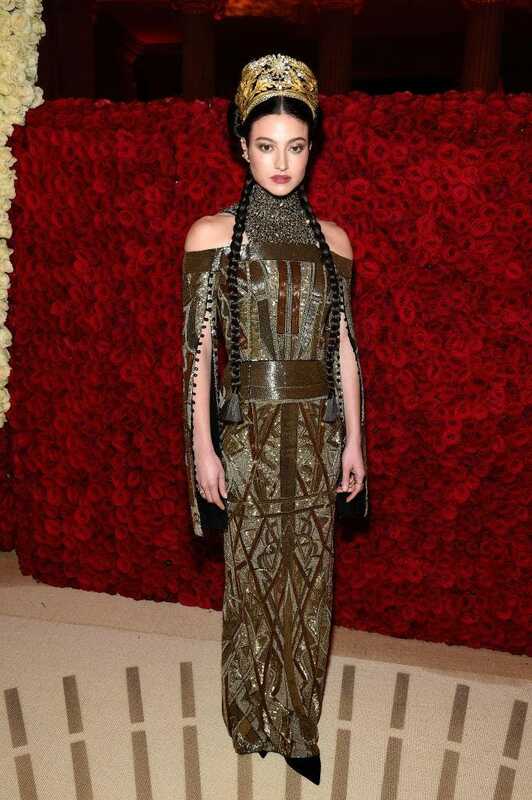 Model Isabelle Wanglon Boemeke, who attended the Met Gala with Joe Gebbia co-founder of AirBnB, wore yellow gold and diamond jewels by Valani Atelier, including the Hexa Yellow Gold Ear Cuff, Rival Ruby Ear Cuff, Vi II Ruby Ear Cuff and Ruby Stud Earrings. Alicia Vikander wore Nikos Koulis jewels on the red carpet including diamond, white gold and black enamel earrings, bracelet and two rings, all from the Oui collection. Fashion designer, Stella McCartney, wore emerald and diamond drop earrings weighing a total of 17 carats, by Kwiat. Singer Miley Cyrus wore jewelry by Sydney Evan on the red carpet that included Custom Baguette & Round Bezel Medium Hoop Earrings with a large bezel cross, a Pyramid Spike Cross Charm, Small Spike Studs, Pavé Chain Link Ring in yellow gold, and a necklace. Singer and actress Ariana Grande wore Butani 8-carat diamond stud earrings. Singer-songwriter Mary J. Blige wore L’Dezen by Payal Shah diamond earrings. Actress Lili Reinhart wore pieces from Featherstone Fine Jewelry, including Luna Earrings in platinum, 2.23 carats of diamonds and Tahitian Pearls; and the platinum and diamond Double Aces Ring. She also wore a Djula diamond ring. Singer-songwriter SZA wore a Djula diamond ring. Model Cara Delevingne wore a Noudar white diamond two-finger ring and hand bracelet. Comedian Tiffany Haddish wore Dvani black diamond stud earrings.